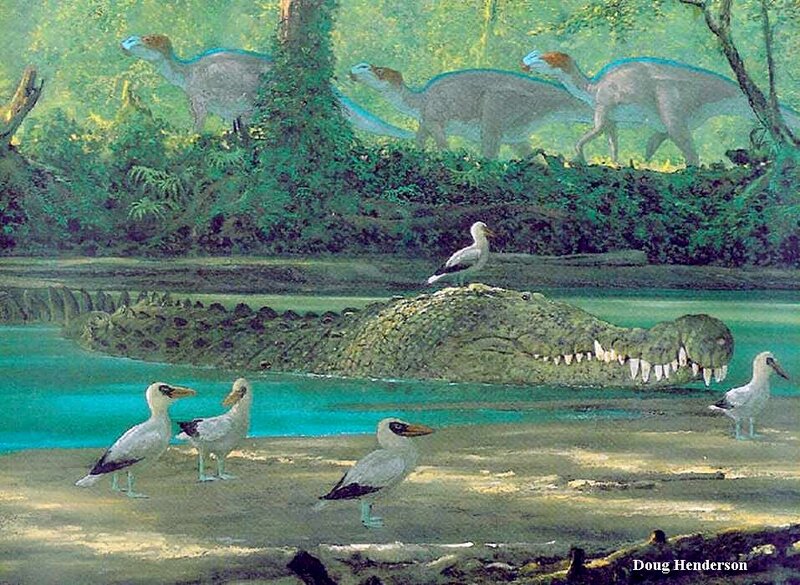 LEFT: Primitive toothed birds called Ichthyornis dispar rest near the large crocodile Deinosuchus while a herd of hadrosaurs (Claosaurus agilis Marsh) passes by in the background in this paleo-life art by Doug Henderson. Copyright © Doug Henderson; used with permission of Doug Henderson. While Deinosuchus remains have not yet been found in Kansas , another similar but smaller crocodile called Dakotasuchus kingi is found here. 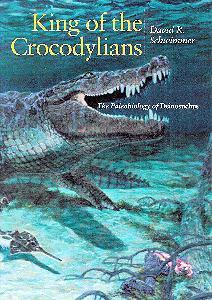 See David Schwimmer's book, "King of the Crocodylians" for more information on Deinosuchus. The remains of Cretaceous crocodiles are rare in Kansas, mostly because much of the state was completely underwater much of the time, but some remains have been found here. 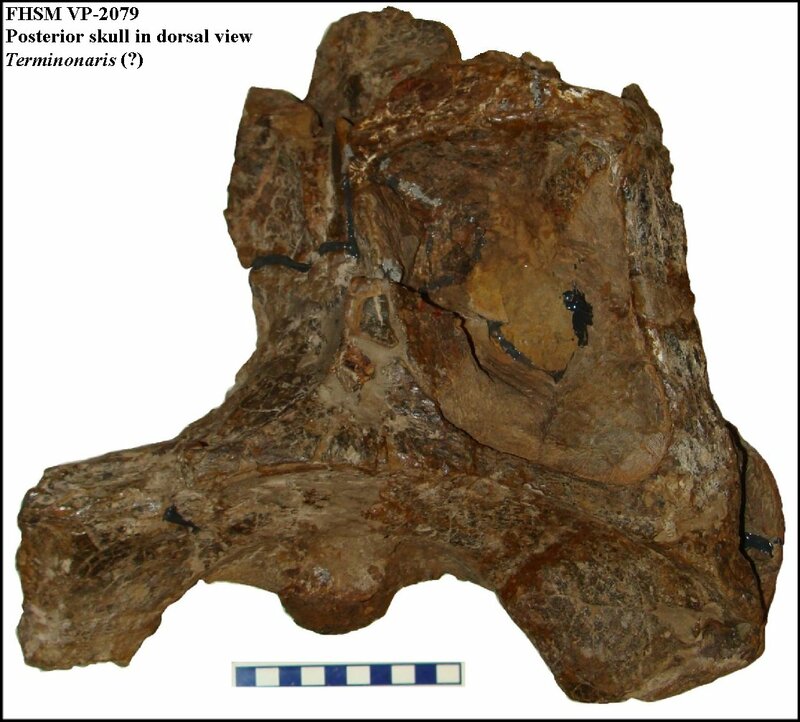 The first one, Hyposaurus vebbii, was described from a single cervical vertebra recovered during the construction of a water well in the Dakota Sandstone near Brookville, Kansas. Most of the rest are known only from single bones, teeth or dermal scutes. The only reasonably complete specimen is that of Dakotasuchus kingi, discovered by a geologist (A. Wheeler Jones) around 1910 in the Dakota Formation west of Salina, Kansas. Crocodile remains occur in the Kiowa Formation (Albian, Early Cretaceous) and the Dakota Formation (Cenomanian, Late Cretaceous). Both formations were deposited in shallow, near-shore environments. Lane (1946) reported that the only known crocodile specimens from Kansas were Cretaceous in age. 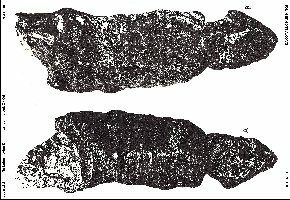 However, Liggett (1997) has since reported finding crocodile remains (scutes and teeth) in Tertiary deposits in southwest Kansas. LEFT: E.D. Cope (1872, 1875) reported the first crocodile from Kansas, Hyposaurus vebbii, based on a single cervical vertebra recovered from from a well being dug in the Dakota Formation near Brookville, Kansas. It was collected and sent to him by a friend, William Webb of Topeka, KS., and named in his honor. 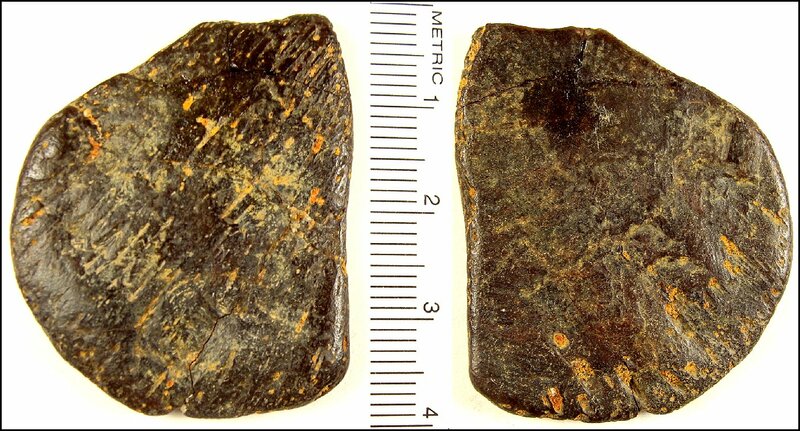 LEFT: Williston (1894) reported a crocodile vertebra from the Kiowa Formatione near Ashland, in Clark County, Kansas. 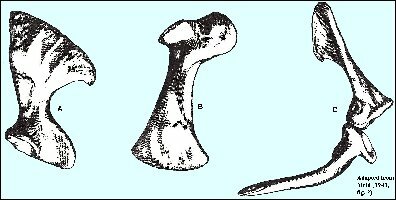 Although he provisionally attributed it to Cope's Hyposaurus, he noted several differences. 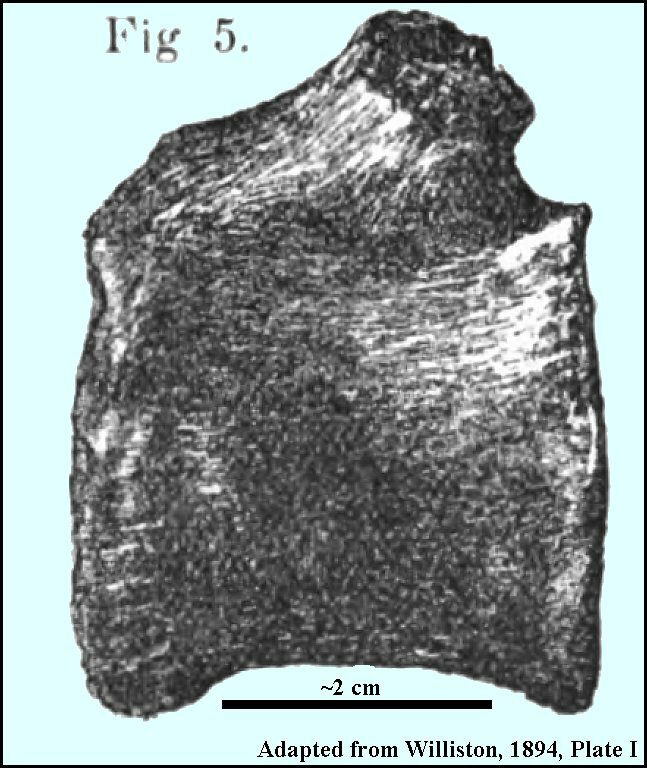 While crocodile teeth and scutes have been reported from the Kiowa Shale in McPherson County (see below and Beamon, 1999), it is possible that this specimen is actually the vertebra of a plesiosaur. 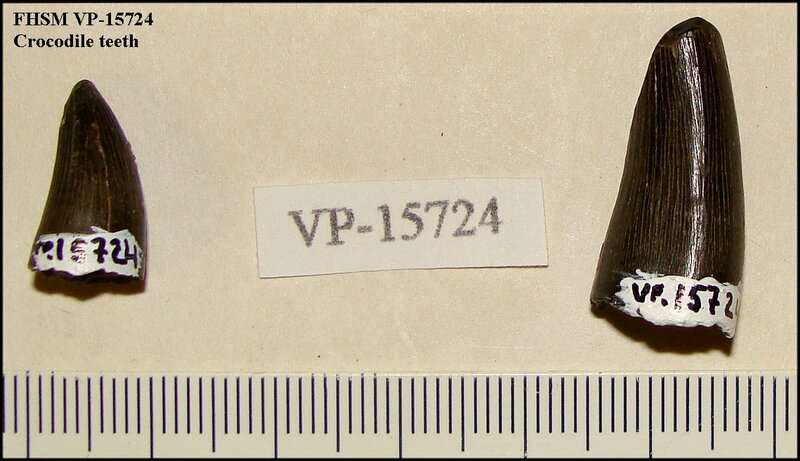 Originally numbered KUVP 829, the specimen is now curated as KUVP 66331. Dakotasuchus kingi was described by Mehl (1941; see also Lane 1946) from the Dakota Formation from "west of Salina. The specimen was last reported (1946) to be in the collection of Kansas Wesleyan University of Salina, Kansas. The current whereabouts of the specimen is unknown. 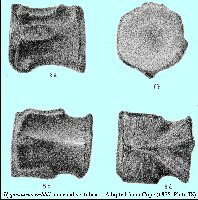 A second specimen (a single scute; KUVP 9971) was reported by Vaughn (1956) from along the Smoky Hill River in Ellsworth County. It came from either the upper Kiowa or lower Dakota formations. 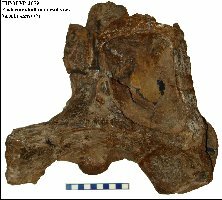 Note that casts of some of the vertebrae from the specimen are currently curated in the Texas Memorial Museum (Austin, TX) as TMM-41379). LEFT: This is a dorsal view of the posterior portion of the the skull of a large crocodile tentatively identified as Terminonaris sp. 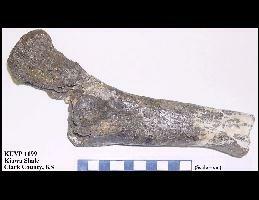 (FHSM VP-2079) from the Dakota Formation of Russell County, Kansas. It was discovered in 1959 by Timmy Harbaugh of Russell, and collected by Myrl Walker. RIGHT: Two of the limb bones of FHSM VP-2079. Other remains include vertebrae and possible elements of the pectoral or pelvic girdles. 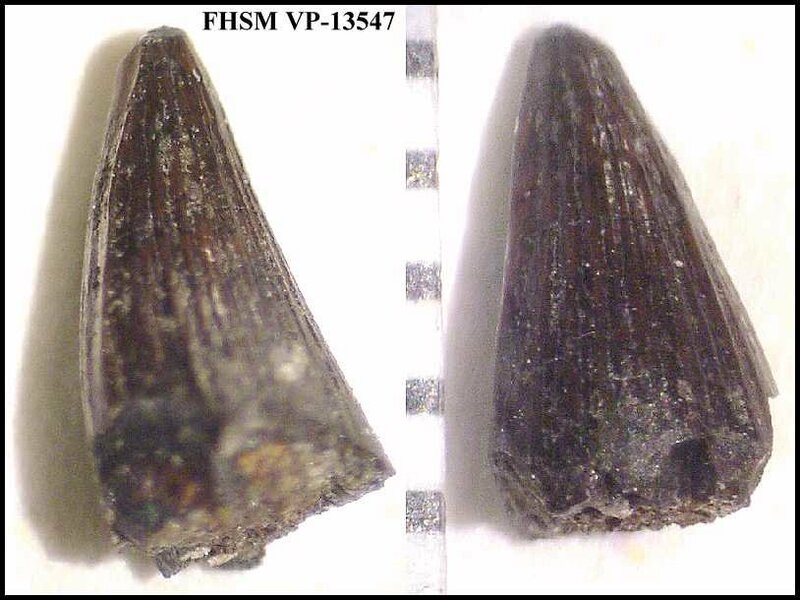 LEFT: FHSM VP-2989 - A portion of the lower jaw (dentary) and two patches of dermal scutes from a crocodile in the Kiowa Formation of Clark County, Kansas. The specimen was collected by Myrl Walker. 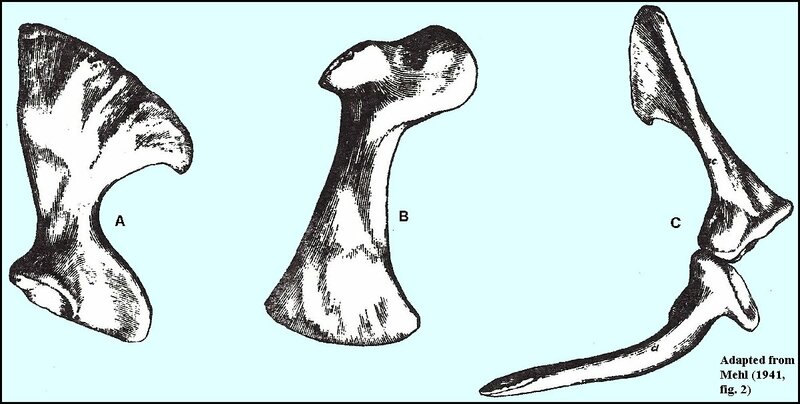 Williston (1903) later described KUVP 1199 as the femur of a new species of giant pterosaur ("Apatomerus mirus"). 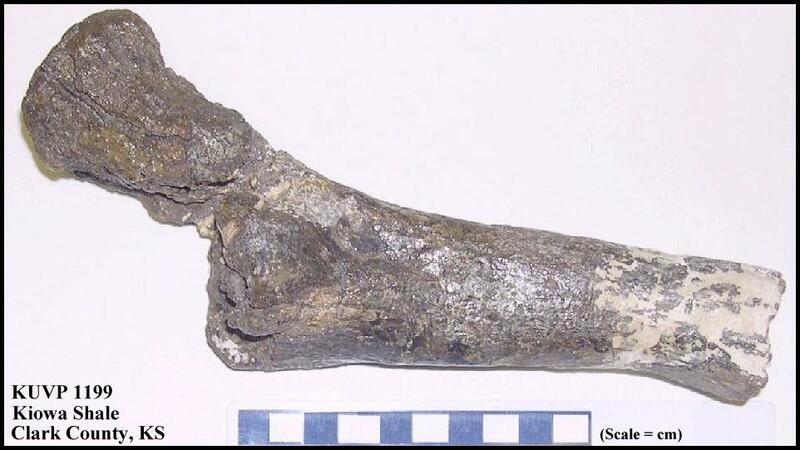 It is most likely the upper end of a plesiosaur propodial. LEFT: A broken crown of a crocodile tooth (FHSM VP-13544) collected by Joseph Beamon from the Kiowa Formation in McPherson County. RIGHT: Two crowns of crocodile teeth (FHSM VP-13547) collected by Joseph Beamon from the Kiowa Formation in McPherson County. 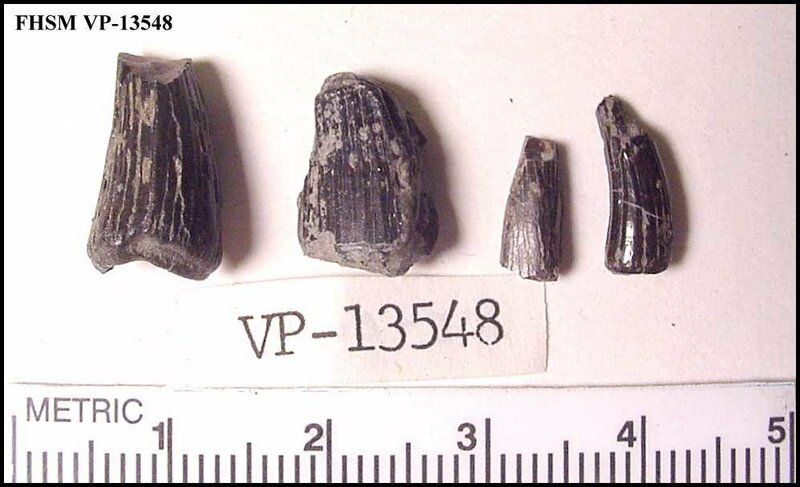 LEFT: Four crowns of crocodile teeth (FHSM VP-13548) collected by Joseph Beamon from the Kiowa Formation in McPherson County. 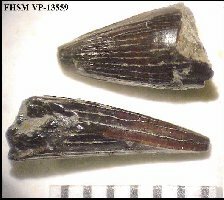 RIGHT: Two crowns of crocodile teeth (FHSM VP-13559) collected by Joseph Beamon from the Kiowa Formation in McPherson County. LEFT: A small crocodile scute (FHSM VP-15723) collected by Keith Ewell in 2004 from the Dakota Formation in Russell County. 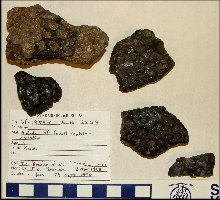 RIGHT: Fragments of crocodile scutes (FHSM VP-13554) collected by Joseph Beamon and others in 1998 from the Kiowa Formation in McPherson County, Kansas. 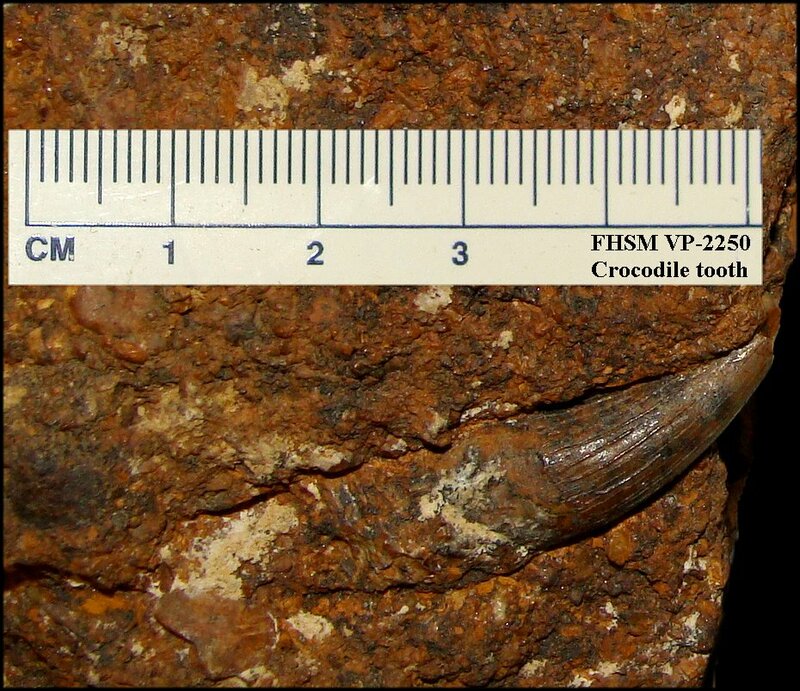 A large number of small fragments of crocodile teeth were also collected. 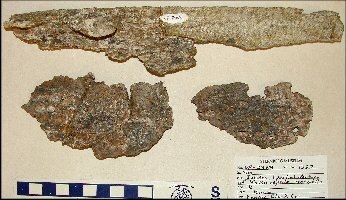 LEFT: An well-polished crocodile scute collected by Keith Ewell in 2004 from the Dakota Formation in Russell County. 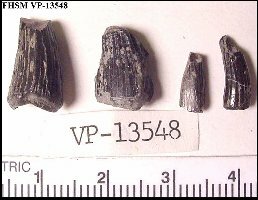 Many of the bones, scutes and teeth found in this part of the Dakota Formation were worn smooth by abrasion from the river or beach sand. 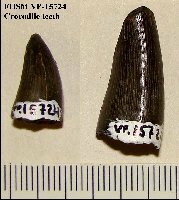 RIGHT: Two crowns of crocodile teeth (FHSM VP-15724) collected by Keith Ewell in 2004 from the Dakota Formation in Russell County. 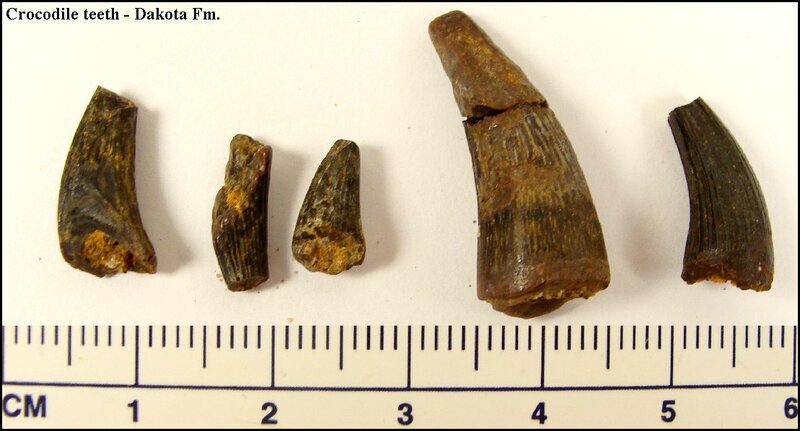 LEFT: Four views of a small crocodile tooth collected from the Dakota Formation, Russell County, Kansas collected by Keith Ewell in 2005. More here. 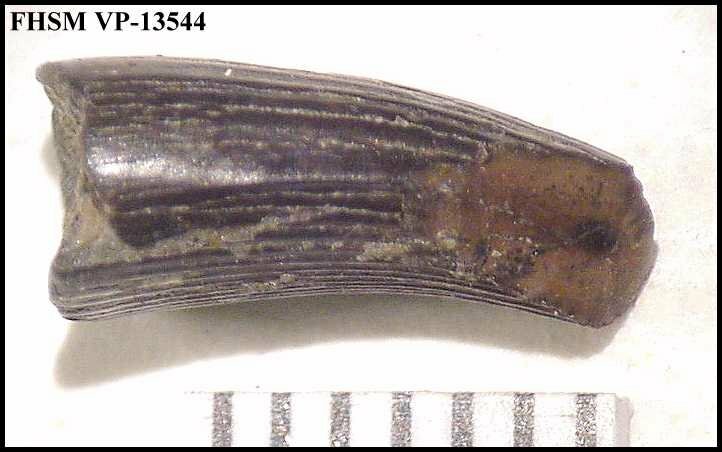 RIGHT: A crocodile tooth (FHSM VP-2250) collected from the Dakota Formation in 1967, still embedded embedded in the iron-stained, sandy matrix. 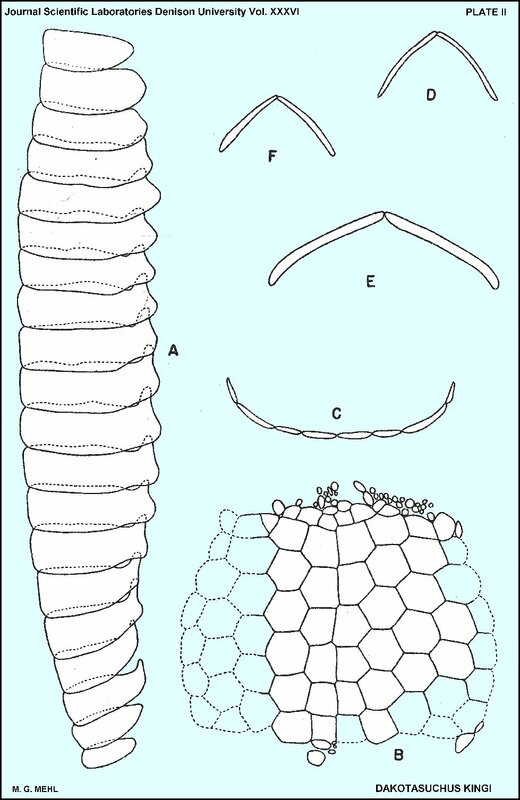 LEFT: Partial rostrum of Terminonaris cf. 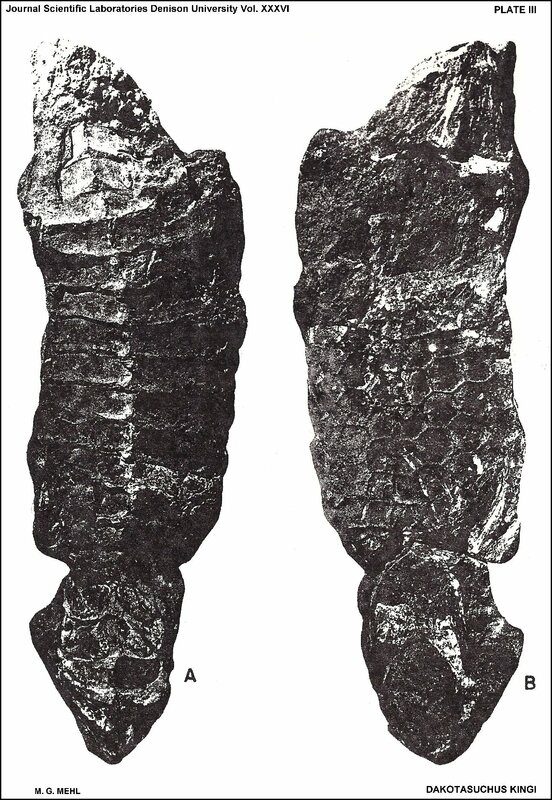 T. browni Osborn, 1904 (FHSM VP-4387) in dorsal and ventral views from the Fairport Chalk Member (Middle Turonian), Carlile Shale, Russell County, Kansas. 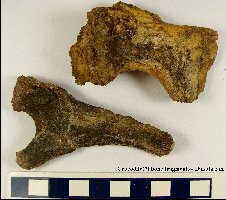 RIGHT: Possible crocodile bone fragments collected by Keith Ewell in 2004. from the Dakota Formation, Russell County, Kansas. 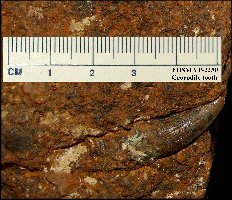 In 2007, Kenshu Shimada and David Parris reported on the snout (above) of a long-snouted crocodyliform (Terminonaris) from the Fairport Chalk (Carlile Formation) of Russell County. This is an unusual specimen because the snout came from a shore-dwelling crocodile, but it was found in marine sediments (chalk) deposited far off-shore. It is also the only known crocodile from the the Carlile Formation. The most likely explanation was that the bloated carcass floated out to sea where it fell apart and was buried. 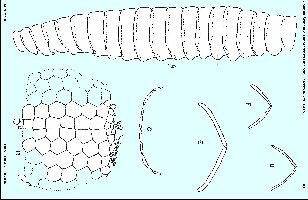 This genus was originally named Teleorhinusbut that name was pre-occupied (See Wu,, et al., 2001). Beamon, J.C. 1999. Depositional environment and fossil biota of a thin clastic unit of the Kiowa Formation, Lower Cretaceous (Albian), McPherson County, Kansas. Unpublished MS Thesis, Fort Hays State University, Hays, KS, 97 pp. Cope, E.D. 1872. On the geology and paleontology of the Cretaceous strata of Kansas. Annual Report of the U.S. Geological Survey of the Territories 5:318-349. Cope, E.D. 1875. The Vertebrata of the Cretaceous formations of the West. Report, U. S. Geological Survey Territories(Hayden) 2, 302 pp., 57 pls. Everhart, M.J. 2004. First record of the hybodont shark genus, “Polyacrodus” sp., (Chondrichthyes; Polyacrodontidae) from the Kiowa Formation (Lower Cretaceous) of McPherson County, Kansas. Kansas Academy of Science, Transactions 107(1/2):39-43. Everhart, M.J. 2011. Occurrence of the hybodont shark genus Meristodonoides (Chondrichthyes; Hybodontiformes) in the Cretaceous of Kansas. KansasAcademy of Science, Transactions 114(1-2):33-46. Everhart, M.J. 2016. William E. Webb – Civil War correspondent, railroad land baron, town founder, Kansas legislator, adventurer, fossil collector, author. Kansas Academy of Science, Transactions 119(2):179-192. (Hyposaurus vebbi). Garcia, W.J. 1999. Teleorhinus (Crocodylimorpha) from the Dakota Formation (Cretaceous) of Kansas, with a discussion of its paleoecology. Unpublished Masters Thesis, Fort Hays State University, Hays, Kansas, 97 pp. Lee, Y.-N. 1997. The Archosauria from the Woodbine Formation (Cenomanian) in Texas. Journal of Paleontology 71(6):1147-1156. Liggett, G.A. 1997. The Beckerdite local biota (Early Hemphillian) and the first Tertiary occurrence of a crocodilian from Kansas. Kansas Academy of Science, Transactions 100(3-4):101-108. Mehl, M.G. 1934. Crocodilian remains Dakota sandstone of western Kansas. Proceedings of the Geological Society of America. (Meeting abstract, 1933, p. 368). Mehl, M.G. 1941. Dakotasuchus kingi, a crocodile from the Dakota of Kansas. Denison University Bulletin, Journal of the Scientific Laboratories 35:47-65. Schwimmer, D.R. 2002. King of the Crocodylians - The Paleobiology of Deinosuchus. Indiana University Press, 220 pages. Shimada, K. and Parris. D.C. 2007. A long-snouted Late Cretaceous crocodyliform, Terminonariscf. T. browni, from the Carlile Shale (Turonian) of Kansas. Kansas Academy of Science, Transactions 110(1/2): 107-115. Vaughn, P.P. 1956. A second specimen of the Cretaceous crocodile Dakotasuchusfrom Kansas. Kansas Academy of Science, Transactions 59(3):379-381. Williston, S.W. 1898. Crocodiles. The University Geological Survey of Kansas, Part IV, 4:75-78, pl. 9. Williston, S.W. 1894. On various vertebrate remains from the lowermost Cretaceous of Kansas. Kansas University Quarterly 3(1):1-4, pl. I.
Wu, X.-C., Russell, A.P. and Cumbaa, S.L. 2001. 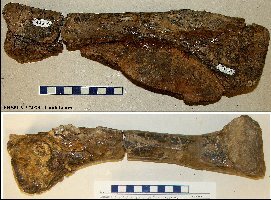 Terminonaris(Archosauria: Crocodyliformes): new material from Saskatchewan, Canada, and comments on its phylogenetic relationships. Journal of Vertebrate Paleontology 21:492-514.